A nice antique brass and copper fire extinguisher. 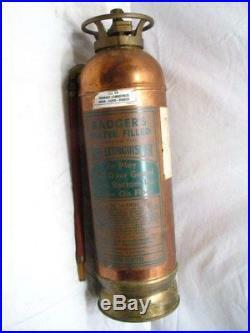 A Badger Water Filled Fire Extinguisher. This is empty, looks like it was meant to be filled with a bicarbonate of soda cartridge and water. Some minor wear, oxidation and a few dings. Side hose is a bit stiff from age. This is not meant to be used and meant for decor only. Expect minor evidence of use or imperfections, dings etc. We take many photos of our items to assist with the description. Please use the photos to help judge content and condition. We have been giving quality service to the on-line collector community for over 19 years. Please inspect your item, and notify us of a return within 3 days of receiving it. Powered by SixBit's eCommerce Solution. The item "Badger Antique Copper/Brass Bell System Water Filled Fire Extinguisher KS-6878" is in sale since Monday, April 15, 2013. This item is in the category "Collectibles\Historical Memorabilia\Firefighting & Rescue\Extinguishers". The seller is "tiquetrader" and is located in Enola, Pennsylvania. This item can be shipped worldwide.